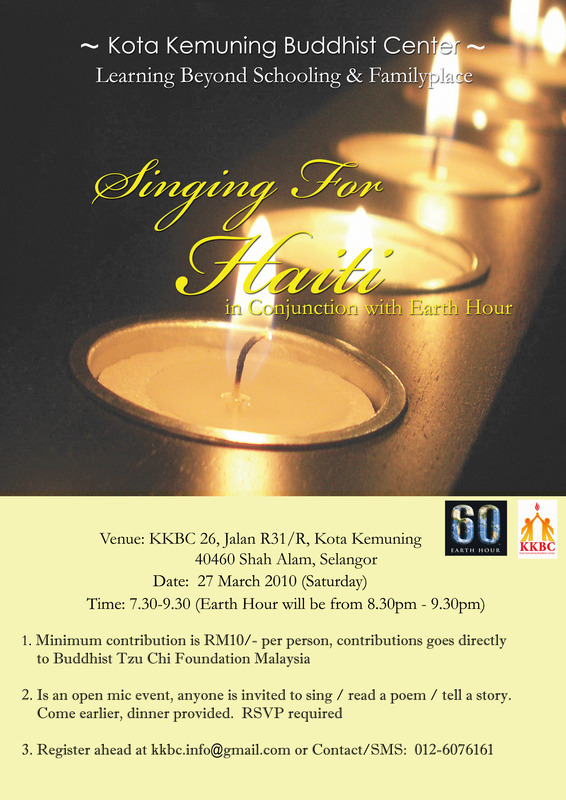 We are lending a helping hand for the people for Haiti in an event organized with Kota Kemuning Buddhist Center (KKBC), supported by us, Learning Beyond Schooling & FamilyPlace to raise funds for Haiti and at the same time taking part in the global event; Earth Hour. There will be open mic sessions so if anyone would like to perform a few songs or a poem reading you can do so too. It will be an interesting event, singing in the DARK (blackout in support of Earth Hour) with candles and lamps! We are not sure it will turn out but I guess it would be fun! This entry was posted in Uncategorized and tagged earth hour, haiti. Bookmark the permalink.